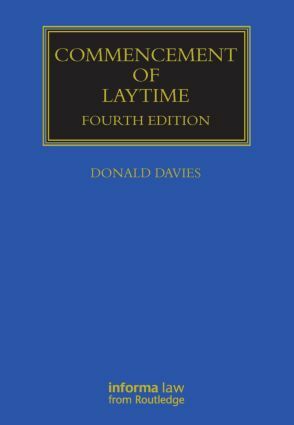 Commencement of Laytime is the only in-depth examination and discussion concerning the most important financial aspect of laytime which can affect all voyage charter parties and international contracts for the sale of goods. The information is presented in a style which is readable by ship operators, traders and other lay persons as well as legal professionals. Donald Davies is a barrister of Gray's Inn, a master mariner, and a Fellow of the Institute of Chartered Shipbrokers, the Chartered Institute of Arbitrators and the Nautical Institute. For academics and practitioners alike, our Maritime and Transport law library offers cutting edge research titles on the whole spectrum of transport law, including shipping, aviation, rail and road. Our authors come from the premier maritime institutions, law firms and chambers across the world and are among the leaders in their fields. With key texts including the annual conference papers from the prestigious Institute of International Shipping and Trade Law, as well as authoritative and comprehensive texts such as David Glass’ Freight Forwarding and Multi-Modal Transport Contracts Aleka Mandaraka-Sheppard’s Modern Maritime Law.